Driving in Cyprus is different than in many other countries. Being aware of local customs and traffic flow will make it a lot easier and safer for you. In this article I have gathered these tips based on my own experience, which will make it as simple as possible for you to merge into the Cypriot traffic. Here you’ll find what I think are relevant to highlight to make your experience driving in Cyprus as a tourist or ex-pat as easy as possible. Traffic in Cyprus is left-hand traffic, so if you are used to driving in left-hand traffic I would suggest that you move to the next point. However, if you’re not used to driving in the left hand side of the road, I can offer you some comfort. It is very easy to get used to, and once you are in traffic everything will feel natural after a few minutes. The only time that you in the beginning should be very attentive is when you are starting in a place without traffic. In that case make sure that you actually drive your car into the left lane upon start – with no other traffic to refer to, it is easy to drop back into old habits and choose the wrong lane. And… Unless you want to be the subject of a good laugh, think for an extra second before you approach the drivers seat – It is after all in the opposite side of the car. It is however worth noting that the regulations are not enforced strictly. Presumably that is also one of the reasons behind the relaxed relationship between the driving regulations and the local drivers. There is of course no reason to copy that behaviour in the traffic. In the unlikely event that you should be involved in an accident, it is always great to have followed the regulations. 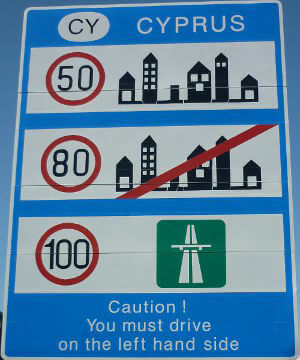 The speed limits are mostly clearly marked and generally resembles the speed limits in most other European countries. The speed limits are marked in km/h (kilometre pr hour) and not mph (miles per hour), although the speed limits are shown in both units some places. On the highways the speed limit varies from what you’d usually experience in most countries. On highways the limit is 100 km/h and every day you will see the traffic police parked along the highway trying to catch speeders. However, it is worth noting that the police don’t stop cars unless they are running at more than 19 km/h over the limit. You will also see a lot of signs showing automatic speed control. Just ignore these! At the moment (July 2015) there is only one automatic speed control in Cyprus – On the road in Nicosia that begins where the highway ends. 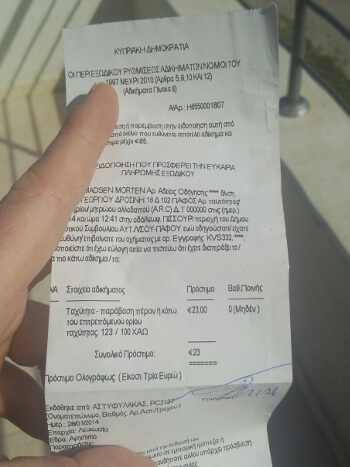 Furthermore the fines for speeding are small in Cyprus. You can see a list of the size of fines at the bottom of the article. Driving under influence or while impaired is fined significantly stronger than speeding and you can find the fine structure at the bottom of this article. There will be the odd police check ups, but to my understanding overall it is not something the local police are overzealous about. It is a legal requirement to use seatbelt when you are driving or when you are a passenger in a car. You will definitely see a lot of people – and even kids jumping around in the car – without seatbelts. But if you are caught by the police, you will be looking at a fine. You can see an overview of fines at the bottom of the page. Anything really. Generally you will experience that a lot of traffic customs and conventions are different in Cyprus. In this section we’ve included the most noticeable differences, but the best tip is this: Be alert. Here are the some of the things that is worth noting before going headfirst into the Cypriot traffic. Roundabouts are a cause of confusion for many Cypriot drivers. Even though there should be no difference driving in a roundabout in Cyprus and most other countries (except most countries drive in the right hand side), it is quite different. The reason is simple: 51% of Cypriot drivers do not know how to drive and position themselves correctly in a roundabout. And the result of that is that drivers position themselves as they know best or that fit their route best, which is usually not in a way that facilitates a quick and safe run of traffic. No one like a route longer than necessary – unless you are in for the scenic route. The same very much apply to Cypriot drivers, as they are known to take the small short cut and cut the corner in bends or when turning. Once the light turns green, you will expect to have right of way if you are going straight or turning left. That is also correct, but what you will experience in the traffic in Cyprus is a bit different. From time to time cars that should be waiting for space to turn right, will start turning immediately as the signal goes green. This is definitely worth to be aware off if you are first in line at traffic lights. You will experience that many drivers in Cyprus are driving very close to or beyond the center line of the road and in many cases blatantly ignoring road markings. There seems to be the simple explanation behind that behaviour that you no doubt will adapt to soon yourself. The road quality is generally not great, which is especially noticeable in the edge of the roads. Hence many people prefer not to expose their car to the unnecessary holes and bumps along the edge of the road. As mentioned earlier in this article, traffic legislation is often followed as were it guidelines and the same is the case with road markings. 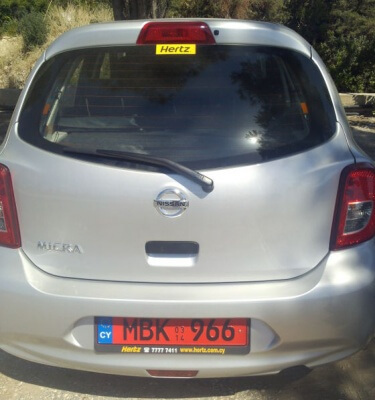 In Cyprus you will experience a distinct lack of use of turn signals to indicate, where the driver intends to go. This applies to both changing lanes on the highway as well as in any other traffic situations and turns. It can potentially be very dangerous, but now you are aware of it and will be able to avoid any potential dangerous situations. It’s the best friend of every driver on the island – the horn. It is used a lot – also when unnecessary. But if you only have your own ability to get forward as quickly as possible, then using the horn a lot and repeatedly is obviously an option, although it will rarely get you the desired result. As in the rest of Europe, double lined road markings means that it is illegal to stop or park here. That is technically also the situation, but as mentioned elsewhere in this article, some of the rules are often interpreted as guidelines. 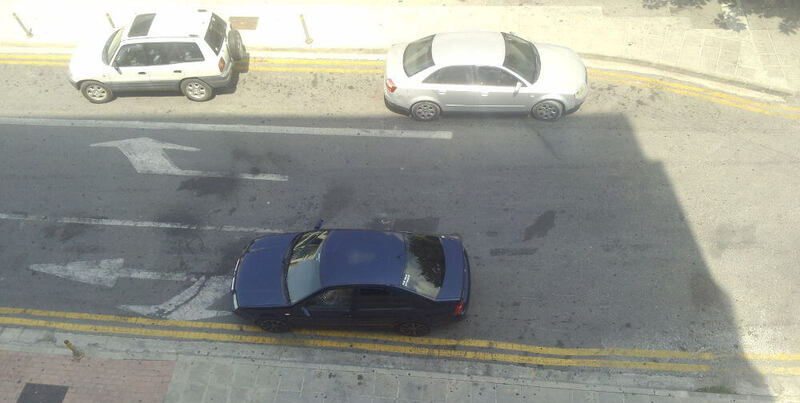 The unofficial rule in Cyprus is that if there a space is not occupied by another car, it is a potential parking spot. Sometimes the police will hand out fines for illegal parking, but it is rarely seen so there is no real preventive effect of the parking fines. Another somewhat popular method of parking is to simply just stop your car, turn on the hazard lights and go do your business. If that means partly blocking the road, that is the way it is. However this method is only used for shorter term parking up to 15-20 minutes. The highways in Cyprus connects all the big cities. In total there are three highways in Cyprus and they all merge together. The longest stretch is A1 from the capital Nicosia to Paphos, although it changes to A6 after passing Limassol. There is also a highway from Nicosia that passes Larnaca before reaching Ayia Napa. Finally there’s a highway from Larnaca that connects with A1 before Limassol and connects all the highways. Now, when existing these highways outside the bigger cities you will have to be very careful, as some of the exits are very short plus they might end in a 90 degree turn, where the speed limit is as low as 25-30 km/h. Therefore it is very important to be prepared to leave the highway and slow down a little before the exit. Obviously the first and most important thing to focus on is getting yourself and everyone else out of harms way, get into safety and make sure that the police has been contacted. The Police should always be contacted if you are involved in a traffic accident in Cyprus and they will subsequently call an ambulance or the fire service to the scene of the accident, if it is deemed necessary. However, after contacting the police it is important that you do not move your car from the spot of the accident. No matter how small an accident it is or where it has happened, you should not move your car unless you want to take full responsibility for the accident even though it was not not case. On top of many traffic offences being overlooked by the police, most traffic fines and sanctions in Cyprus are small compared to most other European countries. In the below tables you can find an overview of selected traffic related fines and also learn where you can pay any fines. If you are not an owner of a Cypriot driving license, the penalty points will have no effect for you as pr. July 2015. Here are the fines and sanctions that you can expect for various degrees of drunk driving or driving under influence in Cyprus. You can read much more about the effects of blood alcohol content here. Traffic fines cannot be paid immediately at the roadside to the police officer, and it is not recommended to suggest it. If you have received a traffic fine, you can either pay it at the police station, through your bank or with your credit card online at the JCC Smart website. You will need to create a customer account at the website if you do not already have one. If you are driving in a rental car it is clearly visible to anyone else in traffic. It is not because of the big advertisement sticker from the rental agency, but instead the license plates. The license plate on all rental cars are red with black letters. It stands out. If you are renting a car in Cyprus you should also be aware that there are roads, where your insurance will not cover because of the road quality. This includes roads in remote areas, 4WD roads and some mountain roads. But ask the car rental company and you will know for sure.